Described as part teddy bear, part house cat, the olinguito is by far the front-runner for the best new species discovered this year. While we've actually had an olinguito in captivity for the past 30 years, it was only this August that researchers finally figured out that it was, in fact, distinct from its larger cousin, the olinguo. The nocturnal mammal, native to Central and South America, is cute enough on its own: It weighs in at under an ounce, and has a wooly tail that can measure as long as its body. But things entered a whole different level of adorable when SavingSpecies, a collective of conservation experts dedicated to preventing species extinction, released photos of young olinguitos found at one of its project sites. The group insists that it's science-driven while simultaneously calling our attention to the cub's "bright, curious eyes, and nose custom-adapted for snooping out bits of fruit from the forest." 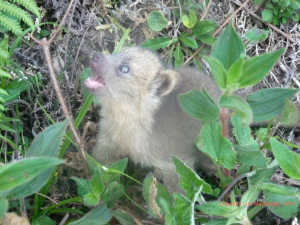 Another photo was released shortly after the olinguito was first identified. It's entirely unclear how it's managed to go unnoticed for so long.